Whilst I had the frame apart to begin draw boring, I decided it was the best time to shape the feet. Originally, the feet were designed to slope from the bottom of the foot to the bottom of the rail. However, for some reason…perhaps I read my schematics wrong…I stopped the cut 1/4″ below the rail. It’s funny because I didn’t notice the error until I put the frame back together. What I did notice was how much I liked this error. I think it adds a little bit more detail to the frame…it draws your eye giving it a more pleasing look. The first thing I set out to do was make me some pegs. I had some walnut cut offs laying around the shop. I found an 8/4 piece that had fairly straight grain. 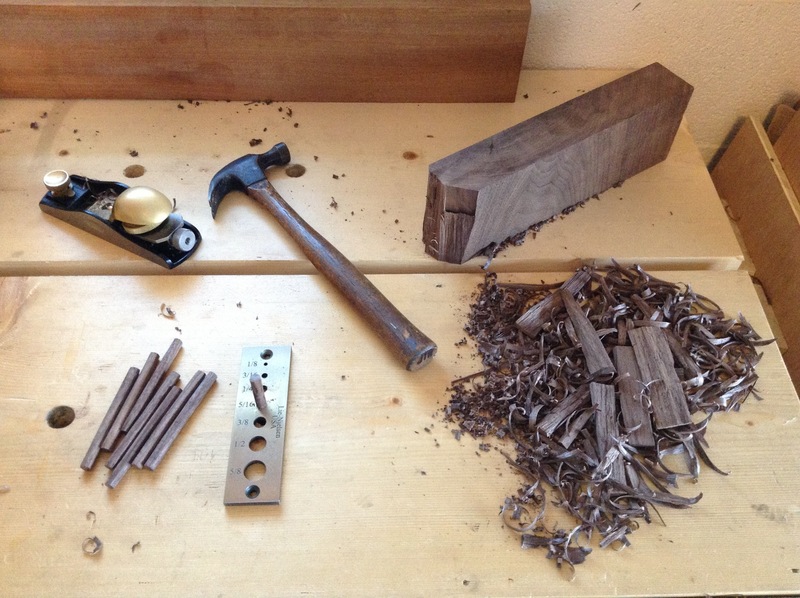 I then simply took my largest chisel and split off some chunks along the grain. I continued to shave them down with the chisel till they could just fit into the 3/8″ mark on my dowel plate. I hammered those suckers through one by one, shaved the tips a little more and hammered them through the 5/16″ hole in the plate. I needed a total of (12) pegs for both panels. I started the draw boring by drilling the holes in the stiles. 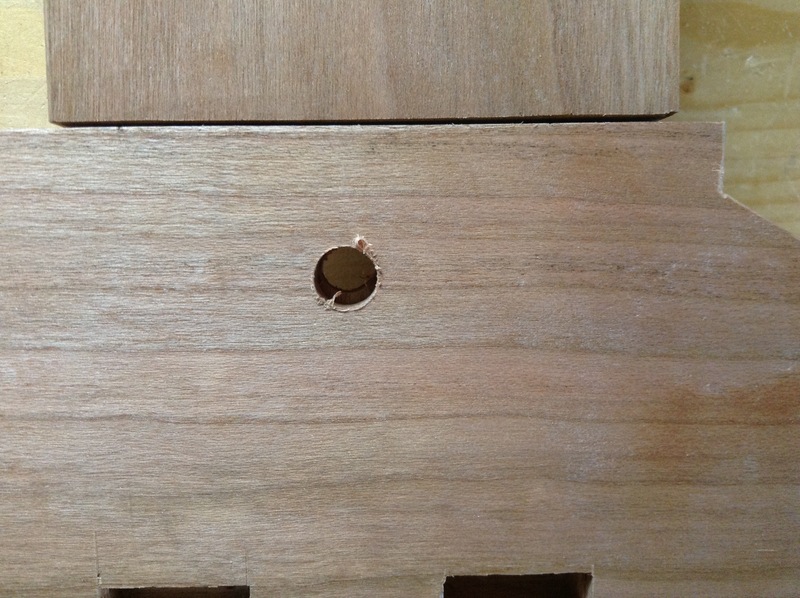 Then marked the holes on the corresponding tenons with the brad point drill bit. 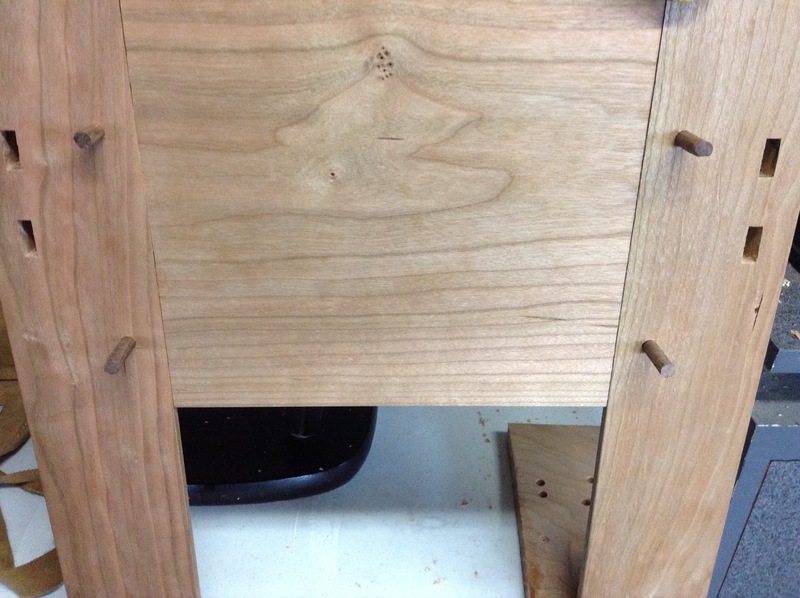 I offset the hole in the tenon by 1/16″ toward the shoulder. 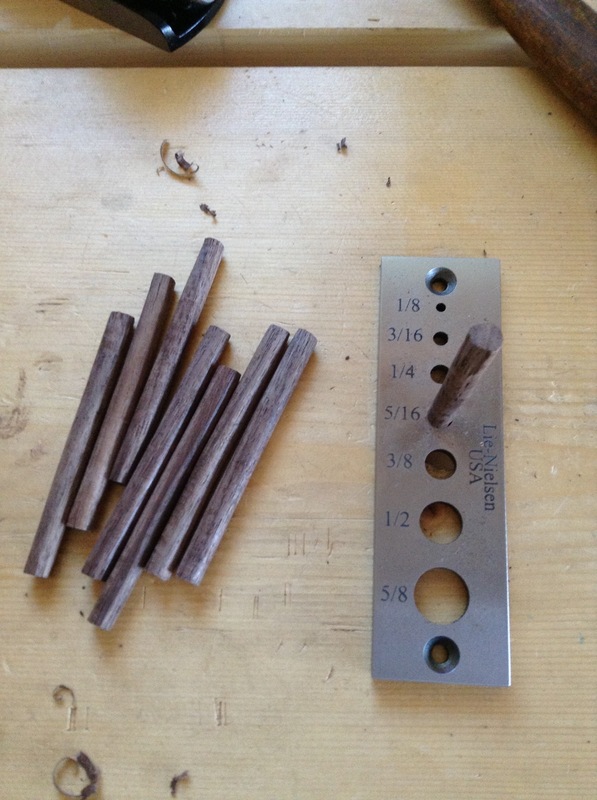 I pulled out my trusty alignment pins from Sears (aka…drawbore pins), and used them to check the fit of all the joints. All looked good, so I applied a little glue to the end of a peg and hammered it through. 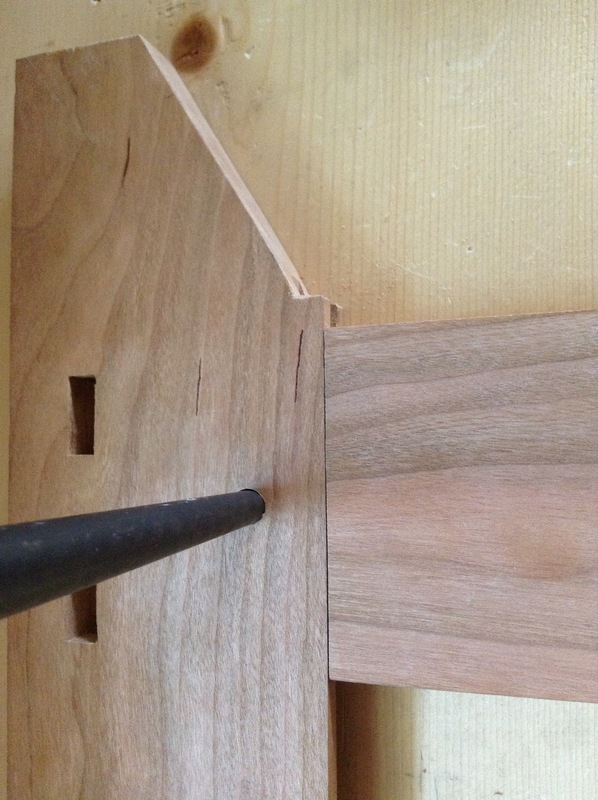 I don’t apply glue to the tenons…the mechanical bond is plenty for me. 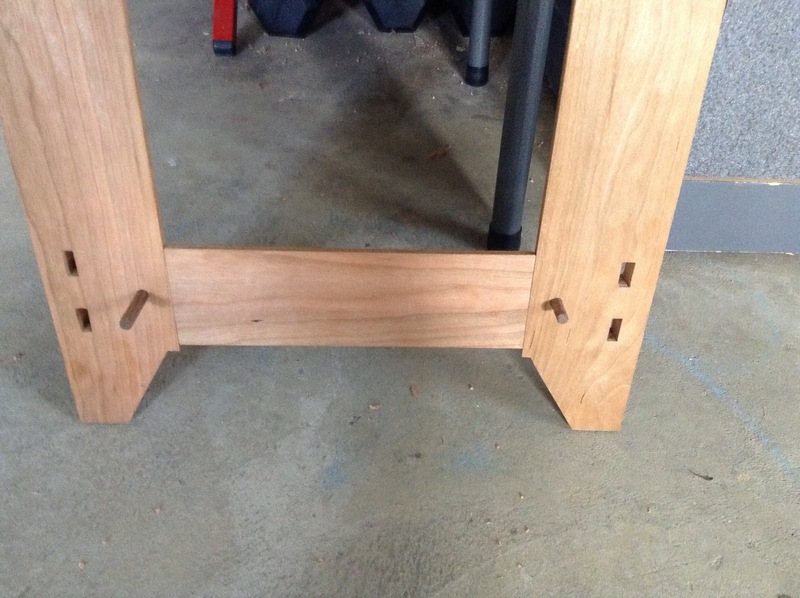 This entry was posted in Chiffonier, hand tools, woodworking and tagged chiffonier, draw bore, furniture, hand tools, woodworking by villagecustomfurniture. Bookmark the permalink.